Dudjom Traktung Pema Sokdrub Zabmo (Wyl. bdud 'joms khrag 'thung pad+ma'i srog sgrub zab mo), ‘The Vital Essence Sadhana of Dudjom Traktung Pema’ is the main Dorje Drolö cycle revealed by Dudjom Rinpoche in 1917 as a gongter. This particular sadhana was Dudjom Rinpoche's heart essence  and has become now the main Dorje Drolö sadhana within the Dudjom Tersar lineage. The Dudjom Traktung Pema Sokdrub Zabmo is centered on Dorje Drolö but also connected to Amitayus. “This particular sadhana, called Dudjom Traktung Pema Sokdrub Zabmo “The Vital Essence Sadhana of Dudjom Traktung Pema” was Dudjom Rinpoche's heart essence. By doing this practice, Dudjom Rinpoche overcame many obstacles and gained long life”. "At that time, I was afraid on account of the sacred pledge that if I showed the sadhana to anyone, my life-force would be severed. Therefore, I practised it secretly while outwardly I practiced the two above-mentioned sadhanas. . It became clear to me that when the obstacles of the Dark Age would surge like strong winds, only the power of this instruction would allow my life-force to be maintained, and then only like a butter lamp. I had great confidence in the power of this new terma. Now, [in 1954], I have crossed the difficult passageway of fifty-years ad Gyurme Yönten Gyatso, who is an excellent mantra-practitioner, has implored me earnestly and fervently, to reveal at all costs, the profound secret sadhana od Dudjom Dorje. Therefore, I released the secret seal and revealed this teaching”. ”Once, Dilgo Khyentse Rinpoche requested Dudjom Rinpoche to grant him his termas cycle empowerment, but because of the time available, he asked Dudjom Rinpoche to give him his most important practice empowerment. Dudjom Rinpoche then answered to Dilgo Khyentse Rinpoche that his most important terma was Dorje Drolö. And he gave it to Dilgo Khyentse Rinpoche”. Today, the Dudjom Traktung Pema Sokdrub Zabmo, the main Dorje Drolö practice of Dudjom Rinpoche, is still kept very secret and is very rarely transmitted. Dudjom Rinpoche, Jigdral Yeshe Dorje, ‘The Vital Essence Sadhana of Dudjom Traktung’, translated by Lama Dechen Wangmo and Ron Garry, Vajrayana Foundation Bero Jeydren Publications, Corralitos, CA, 1997, second edition 2002. ↑ According to oral instructions given by Bhakha Tulku Rinpoche. ↑ Dudjom Rinpoche, Jigdral Yeshe Dorje, ‘The Vital Essence Sadhana of Dudjom Traktung’, translated by Lama Dechen Wangmo and Ron Garry, Vajrayana Foundation Bero Jeydren Publications, Corralitos, CA, 1997, second edition 2002, colophon, page 29. ↑ Khenpo Tsewang Namgyal ‘Light of Fearless Indestructible Wisdom’, The life and Legacy of Dudjom Rinpoche, Snow Lion, 2008. Page 180-181. ↑ The Duddul Ter Jyön Drolö is a Dorje Drolö practice revealed by Rigdzin Düddul Dorje. ↑ The Dudjom Drolö is a Dorje Drolö practice revealed by Dudjom Lingpa, predecessor of Dudjom Rinpoche. ↑ Dudjom Rinpoche was outwardly practising the Dorje Drolö sadhanas of Rigdzin Düddul Dorje and of Dudjom Lingpa, but in fact was secretly practising the Dudjom Traktung Pema Sokdrub Zabmo, his own terma. ↑ Instructions given for a Dorje Drolö empowerment granted by Shenphen Dawa Rinpoche in March, 2012, in Yeshe Nying Po, NYC, USA. 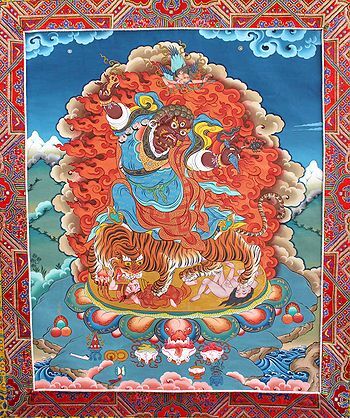 ↑ Sogyal Rinpoche, oral story shared on August, 27th, 2009, in Lerab Ling, while Sogyal Rinpoche was doing his personal practice in the main temple, and before giving a blessing to Rigpa’s French sangha. This page was last edited on 24 July 2014, at 10:04.